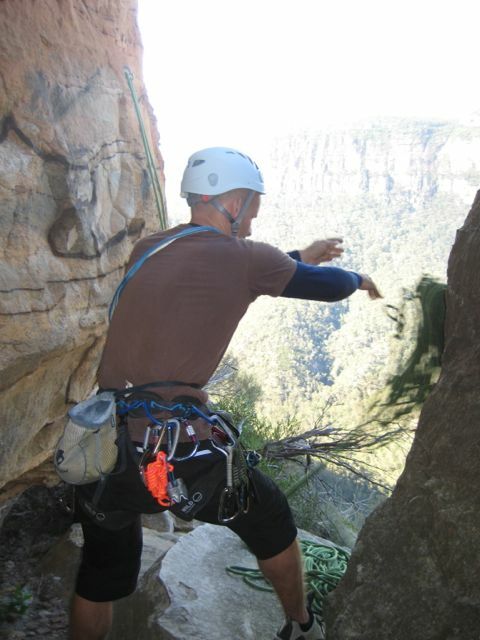 With a flick, I managed to free our abseil ropes from a wedge between a small ridge of rock spires and the cliff face. Tension released, the ropes, to which I was also attached, suddenly whipped out to the right. ‘That was a bad idea,’ I thought as I was wrenched from the ridge, hurtling towards a sheer cliff face, 100m above the ground. I braced for inevitable impact with the onrushing cliff. Realising the trajectory was out of my control, I focused on holding the rope tight, keeping my belay/abseil device locked. I hit the wall, my shoulder taking the brunt of it, before I spun around, my helmet and back scraping across the ragged sandstone. I came to a halt, having swung maybe 5 or 10 metres. I was OK, apart from a few grazes, and very glad to be wearing a helmet. That was insane. And we hadn’t even started the climb yet. 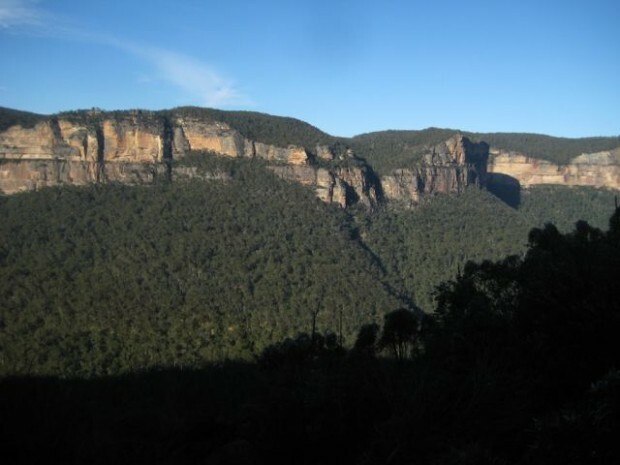 The West Face of the Mirrorball (19/5.10b) is one of the many classic multi-pitch routes that line the 300m sandstone cliffs that define the north side of the Grose Valley, Blue Mountains NP, NSW. Located in the Pierces Pass sector and described as ‘Mega, Mega, Mega’ by the guidebook, the 4-pitch, 110m climb ascends a distinctive pinnacle for 75m before rejoining the main cliff, where it ends in a 45m Grade 18 pitch. It’s the best introduction to the area’s plethora of multi-pitch epics (and one of the few that is within my ability). It was also be my first multi-pitch climb. Access to the climb is via an exposed walk across a long ledge (the Lunch Ledge) beneath a dramatic headwall. Then it’s 2 x 50m raps down to the base of the climb. 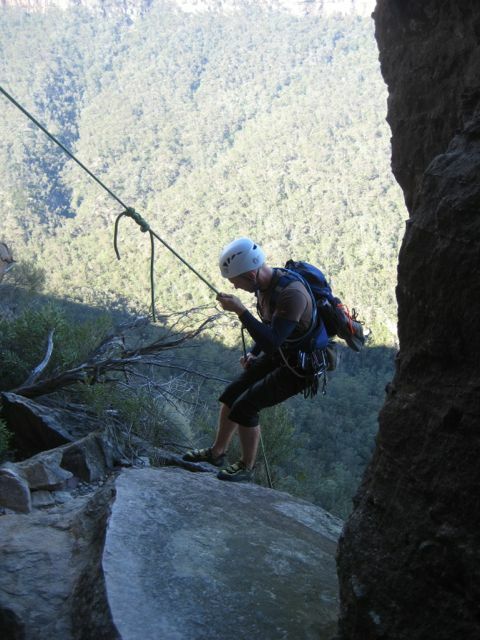 The abseil requires 2 x 60m ropes, tied together. After a circumspect approach along the Lunch Ledge (which wasn’t as exposed as I had feared), Garry and I arrived at the end of the line. We found a pair of abseil anchors at head height and some markings indicating the abseil route veered down and left, landing on top of the Mirroball’s pinnacle. The situation didn’t match the description a climbing friend had given but seemed the best option. Garry cast the ropes off the ledge and went first. The wind was howling that day, with westerly 50-60kmh gusts, and it was impossible to communicate. Some time elapsed, maybe 15 or 20 minutes, since Garry had disappeared over the edge. I continually checked the tension of the rope to see if he had landed. It remained taut. I yelled but couldn’t make out a word of his windswept response. Eventually, I decided it must be safe to start my descent and, heart in mouth, lowered myself over the edge, into the gale, and onto a small platform, from where I could spy Garry some 40m lower on the top of the Mirrorball pinnacle. The wind, which was blowing against the line of our descent, made progress slow. Garry would have had a hard time maintaining course. Relieved, I touched down on the top of the pinnacle and started pulling the ropes through but they wouldn’t budge. We tried pulling, shaking and flicking to no avail. Either the knot was stuck or there was too much friction. 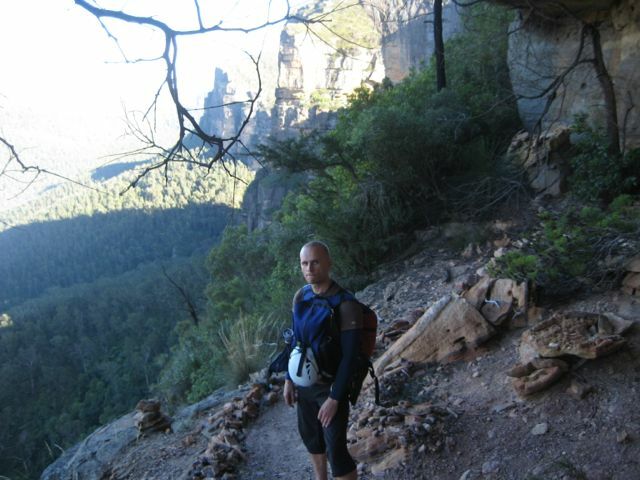 With little option, we improvised a solution: I would reclimb the route in abseil mode – that is, with both ropes threaded through my belay device, pulling through rope as I climbed. 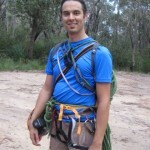 Garry would do the same, and take in any slack in the system, providing a back up if I should I fall (pulling a rope taut from the bottom during an abseil will introduce enough friction to stop a fall). The climbing was easy – jugs and large edges laddered up from the pinnacle and out right towards the mini-ridge, which I was able to straddle. From here, the angle of the ropes became more acute and I was able to slowly start pulling them through. Once I saw the knot appear, we were in the clear and I got ready to abseil back down to Garry. Having ascertained I was OK, I gingerly abseiled back to Garry, walking myself along the cliff face in an almost horizontal line. My swing had been largely obscured by the feature so he hadn’t seen the impact. ‘That was a near-death experience,’ I said once safely anchored beside him. I stood, dazed, in my own little world while Garry pulled the rope through. It came easily this time but in the drama we had forgotten to untie the safety knot at the end of the rope – a beginner’s mistake, which meant the rope could not pass through the abseil anchors. © James Stuart. All rights reserved.